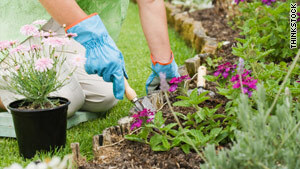 It's the little tips that can make gardening more productive. (RealSimple.com) -- Digging up flowers instead of weeds. Drowning the tulips. Readers reveal their growing woes and garden design pros plot out the solutions. "Last year we built raised garden beds. They looked beautiful -- with fresh mulch all around them and even a new spot watering system. But the mulch around the beds is always soggy -- even in hot, dry Colorado." Garden fix -- Good news: You don't have to tear out the beds entirely, says Ivette Soler, a Los Angeles-based garden designer and writer of "The Germinatrix" blog. Empty the raised beds (dig out the plants and lay them on a tarp while you work) and spread a four-inch layer of gravel evenly over the underside of the planters to improve the drainage. Then refill the planters with fresh fluffy organic compost. "I planted some lovely perennials one summer. The following spring all the flowers sprouted along with some weeds. I pulled the weeds and lovingly tended to the flowers. I even staked a tall lanky plant that I was certain was going to produce a beautiful bloom. Then, one day my neighbor asked me why I had staked a weed. Turns out, I had pulled out the flowers and left the weeds. Oops." Garden fix -- Tracking plants can be tough for any gardener, says Andrew Keys, a Boston area landscape designer and writer of the "Garden Smackdown" blog who cops to mistaking crabgrass for ornamental grass in his own garden. "The most efficient way to mark your plants is to use the nursery tags your plants come with." Another option: Label popsicle sticks and insert them into the ground near your varieties. "We neglected to prepare our soil last year and, as a result, we ended up with a whole vegetable patch of plants that either never gave fruit or died." Garden fix --Since soil varies dramatically by region, Keys recommends testing your soil annually to find out what type of soil you have and what it needs based on what you want to grow. (You can pick up an inexpensive at-home soil testing kit at the hardware store.) Then amend the soil as suggested. No matter what, says Soler, it's a good idea to mix your soil with an equal amount of organic compost. "It's the best foundation for your garden -- it gives your plants the nutrients they need without overloading them with chemical fertilizers which can deplete the microbial activity needed for healthy plant growth." "I kill everything. I never know when to water and when not to water. Help!" Garden fix -- Overwatering drowns plants roots, causing them to rot; underwatering, on the other hand, can dehydrate it. The no-more-guessing approach is to invest in an irrigation system with a "smart" controller, meaning that it automatically adjusts watering levels based on historical data and moisture sensors, says Rebecca Sweet, who designs gardens in the California bay area and writes the "Gossip in the Garden" blog. If you can't afford a system, pay close attention to your soil. When the soil is rock hard, it needs watering. When you can grab a handful, squeeze it together, and form a loose ball, it's just right. One trick: Plant a so-called indicator plant -- one that wilts much more quickly than the others -- such as a hydrangea or lettuce. "One look at them on a hot day will tell you whether or not you need to water your plants," says Sweet. "We planted a horseradish plant in a corner of our garden and were pleased with the crop we harvested the following season. We pulled it all up, tilled the garden in spring, planted for the season, and there it was popping up all over the place! I never knew how invasive a plant could be." Garden fix -- Plants like horseradish, English ivy, Mexican feathergrass, and spiderwort are notoriously invasive in gardens and are best grown in containers, says Pam Penick, an Austin, Texas-based garden designer and writer of the blog "Digging." If you order seeds from a catalog, look for words like prolific reseeder and vigorous growth, which often indicate invasive tendencies. If you do choose to plant an invasive variety, weed diligently. And consider solarizing: Dampen the soil, spread a black plastic tarp over the weeds you want to kill, and secure the tarp's edges with rocks. Leave the plastic in place for a few months while the weather is hot. The plastic will heat up the soil and kill off the weeds. "My daughter and I planted 200 bulbs in our yard as a secret garden that would bloom in spring. To our horror, the squirrels came at night and feasted on our bulbs. That spring only four lonely daffodils grew and we had some very fat squirrels." Garden Fix -- There's a good reason the squirrels left the daffodils alone; daffodils contain poisonous crystals, says Keys. Other rodent-repellant (read: poisonous) bulbs include snowdrops, winter aconite, and fritillaries. Critters from raccoons to deer to the family dog will inevitably try to eat your produce, and the only failsafe way to protect your precious plants is to install a fence around the garden. As for your dog, Penick suggests tossing a few chew toys into the garden to tempt him away from your plants. "I planted tomatoes on the east side of my backyard. They bloomed, and then the flowers would fall off. According to friends, tomatoes need the morning sun, which was blocked by my fence. Who knew?" Garden fix --Tomatoes are sun worshipers that thrive in direct sunlight. The plants need a minimum of six hours of direct sunlight, says Soler. Similarly, vegetable plants such as chiles and eggplants and most herbs should be planted in the sunniest part of your yard. Others, like lettuces and peas, can stand to be in shady areas. "I wanted a little pumpkin patch so I planted some seeds. The patch spread all over the yard and my husband had to lift up the vines to mow!" Garden fix -- Vining plants like pumpkins, cantaloupes, and watermelons can quickly grow to mammoth proportions, says Soler. If you're set on planting a patch, Keys suggests surfing the Web. "A plant's Latin name is the key to everything you could ever want to know about it," he says. "Just Google the Latin name in quotes and the word invasive or aggressive and see what gardeners are saying." Another resource: PlantFiles from Dave's Garden, a Wikipedia-like database of user-contributed data. "My first year gardening I found a spot that I wanted to use for flowers. Problem? Grass. Solution? Grass killer, which unfortunately made the area free of grass and useless for growing anything else. Whoops." Garden fix -- Chemical herbicides poison the soil and can remain in the dirt for years, says Soler. Instead, get rid of grass and weeds by pouring an earth-friendly mix of equal parts hot water and vinegar over the selected area once a day for a few days until the offending plants turn brown. The vinegar will kill the leaves and most of the plants' roots, making it easy to pull up the grass. "I planted too many plants in a pot and they grew in odd shapes and weren't edible. Next year, I'm only planting one plant per pot." Garden Fix-- It's important to follow the planting directions on seed packets and seedlings. But if you choose to plant more aggressively, experiment with layering plants, suggests Soler. Growing shrubby plants such as basil under tall vining plants like tomatoes yields two plants in one space.